LEGO Bowie contemplates post-Ziggy Stardust character ideas: Cobbler Bob? A Mad Deus? Viscount Jizzmark? Yesterday, we paid tribute to the 42nd anniversary of David Bowie's iconic album Low by featuring The Brothers McLeod animation of comedian Adam Buxton's hysterical radio tribute to Bowie from 2013. 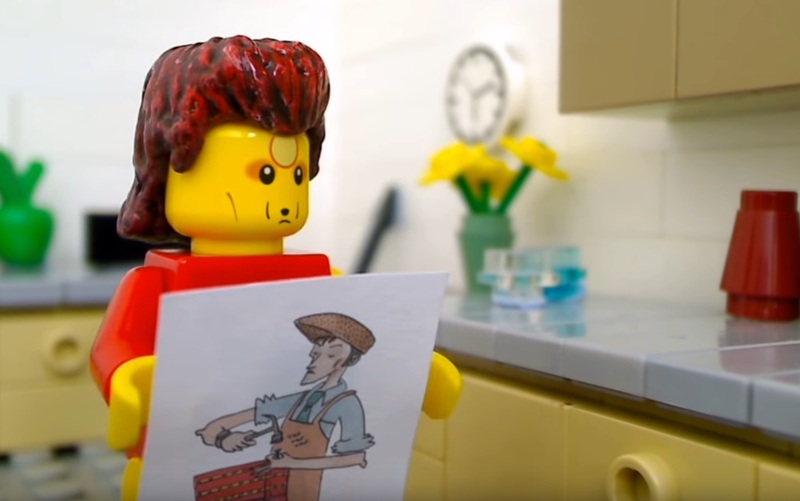 We follow it up with another animation done from Buxton's radio show, this time with Chris Salt of Oblong Pictures using LEGO stop-motion to lovingly lampoon our favorite alien rock god. In the video, David pitches his wife, Angie Bowie, on new character ideas after deciding to "kill off Ziggy." After running through a series of candidates: Cobbler Bob ("I could have giant shoes, with massive platforms big enough for the band to fit inside of"), A Mad Deus ("A composer of classical music who comes to believe that he's God"), The Groovy Gardener, Viscount Jizzmark, finally, he shows Angie Aladdin Sane. "Who is Aladdin Sane?," she coos. "Well, he's like Ziggy, but with a different name, and some sort of strange fluid leaking out of his collarbone," David replies. This cute little bit does make you wonder what other characters David may have contemplated but ultimately rejected.